Blackberry flavor so insanely delicious, it defies all lime or reason. Bogota Blackberry Lime is rated 5.0 out of 5 by 10. If Mother Nature decided to go full mad scientist, she’d definitely fuse together these fizzy blackberry and lime flavors to create something this crazy tasty. We’re still scratching our heads trying to comprehend how 5 calories and antioxidants could combine to make this fantastic explosion of flavor. 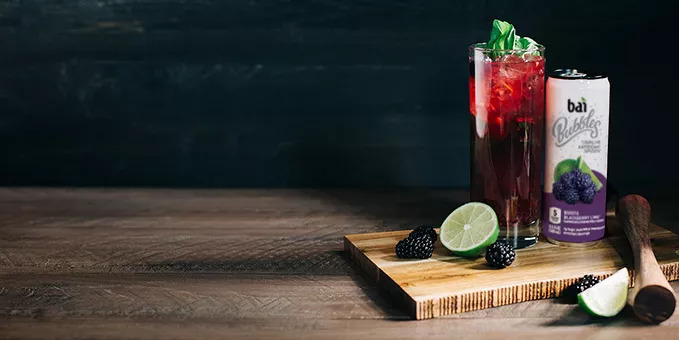 This all might be madness, but if mixing blackberry and lime is wrong, we don’t want to be right.We named our flavors after the coffee growing regions that inspired them, sort of like French Kissing or Bermuda Shorts. Learn about these regions and more here. Every mojito wants its five minutes of fame. But this magical mix will make your taste buds put blackberries in the limelight forever. Add lime and blackberries to a cocktail glass and gently muddle 7-8 times. Add basil and muddle again 4-5x. Add white rum and then ¼ cup of Bogota Blackberry Lime. Add crushed ice, gently stir, top with rest of Bogota Blackberry Lime and then garnish with basil and blackberries. 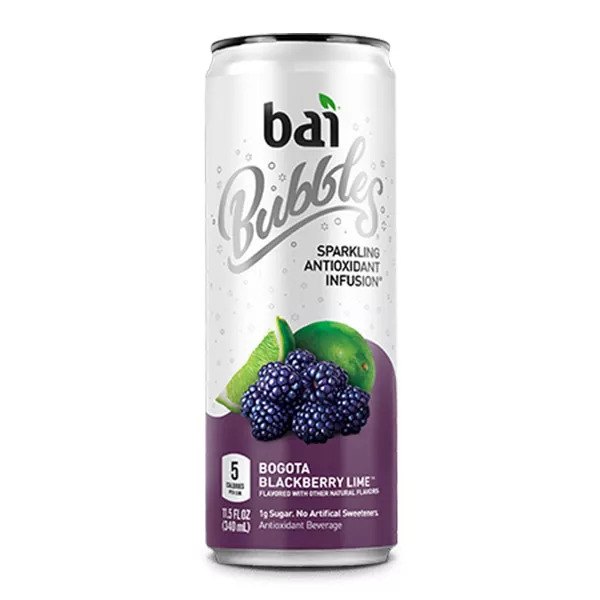 Filtered carbonated water, Bai® Proprietary Sweetener Blend™ (erythritol, stevia leaf extract), natural lime flavor with other natural flavors, citric acid, blackberry juice concentrate, fruit and vegetable juice (for color), malic acid, coffeefruit extract, white tea extract, ascorbic acid (Vitamin C), sodium citrate. Rated 5 out of 5 by DomD from Favorite Flavor I have been addicted to these for months now. This is the best flavor in my opinion! Very tasty, without all of the calories & sugar. No artificial flavors! Rated 5 out of 5 by Wishfulwisdom19 from Balanced product I finally purchased one of the Bubbles Bai tea, I got the Bogota BlackBerry Lime And I truly am enjoying it. I’m not crazy about it but I think overall it’s a really great product. I personally love the bottle packaging itself. The black cap just adds such a cute difference between this brand and others. Can’t wait to try some of the other flavors. Rated 5 out of 5 by Magicgirls4 from Where have you been all my life? I’m a recovered soda consumer for years.. I went down to get water and the blackberry lime caught my eye.. full moon I know may be my over dramatic review but this was a treat to have and I’m going to stock up on more!I considered not reviewing so less people can buy them up, but I want to give kudos where they are deserved.Love! Rated 5 out of 5 by Valerio311 from Amazing! I had to stop drinking energy drinks for my health. Found Bai drinks as a substitute! So much healthier and great flavors. Blackberry lime is a favorite! Rated 5 out of 5 by creativcameron from Best Fizzy Drink to Start The Day I've been drinking Bai for sometime, and this particular flavor stands out the most for me. I drink one almost every day, and I just can't seem to get enough. Thank you for making such a delicious, antioxidant kick-start for my day.